A beautiful Spring day driving past a beautiful spot in Minneapolis. Tarot Stuff: As some of you reading have already discovered, I have picked up Sunday day time shifts at my beloved steady gig, The Eye of Horus! I'll be there from 11:30-6 on Sundays in addition to evenings on Wednesdays. 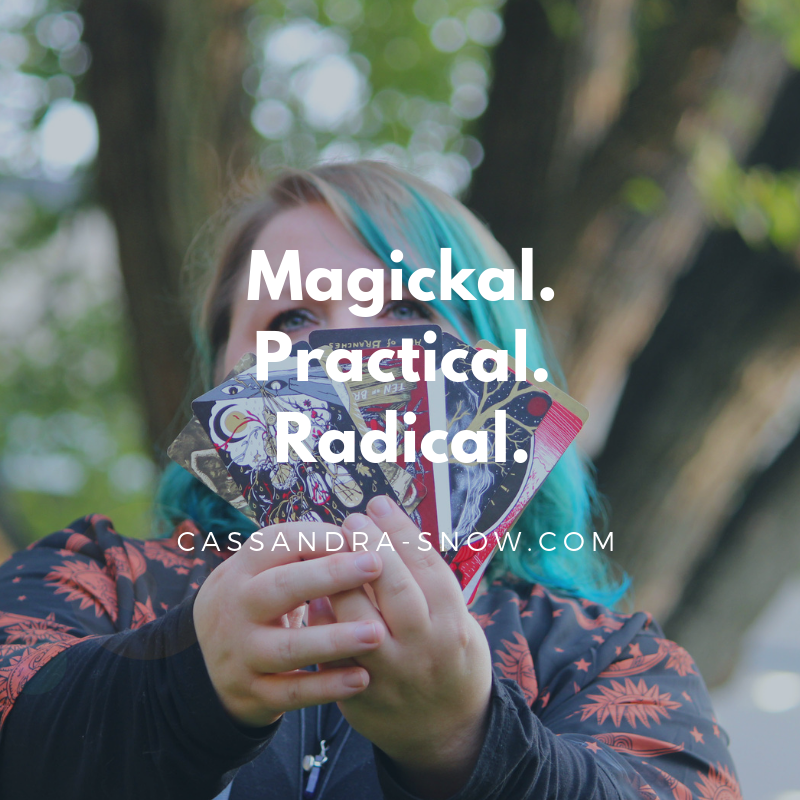 In more mundane news, I've started using my Modern Spellcaster's deck in readings, and I've gotten into a lovely e-mail reading groove with a few of you too! You can find out more about my e-mail readings here. Writing Round-Up! I did a major big kid writer thing this month—I applied to not one but TWO emerging writer's grants to finish a manuscript for a memoir about finding laughter in traumatic circumstances. There's also some Queering the Tarot action here and here, and a profile I got to capture on a poet I just adore here. I'm also working on a second e-book for y'all. This one is a little more substantial but I hope to finish up this month. You can grab my first, a mini e-book about using tarot for healing here. Theatre (and beyond): Oh, you know, just performed improv and front of people for the first time, thus finishing my improv class with a bang. Plus a Drunk Queer History my company organized, a mainstage show I directed, and I dunno, something about us getting a grant for our summer one-act festival. Keep up to date by signing up for Gadfly's mailing list! Favorite things I read: I started the month by breezing through Neil Gaiman's accessible, fun take on Norse Mythology. I got super sucked in to Murakami's weird world again with The Wind-Up Bird Chronicle. I devoured Fisher's Princess Diarist and Mara Wilson's Where Am I Now in approximately a day and a half each. That's a lot, I know but it was a really good book month! Favorite Things I Watched: I went to see King Lear at the Guthrie, not for research or review but just to go. This was the first time I'd gotten to do something like that in a very, very long time and the show was wonderful. The eye gouging piece of the play was SO well executed, and the rest of the show was pretty great too. Alternatively, Manny and I also binged Season 1 of Supergirl in about a week. I am completely obsessed and dying to get my hands on Season 2 even though it's still happening. I saw Get Out in the movie theater and OH. MY. GOD. Even with all the rave reviews I was surprised by how good it was, because it's that good. I don't even like scary movies but I'm raving about this one still. As just a guilty pleasure thing, I've also been watching Trial and Error on NBC. I love John Lithgow and this one is really silly and fun. Other Things I Loved: Manny and I have spent several afternoons or evenings walking along the Mississippi River just chatting about ourselves, art, and the river itself. I'm so overjoyed that we're back in “hanging out near water” season and these escapes have helped my mental health so, so much. Now that it's warming up, if you're physically capable and live near a large body of water—go! What are you doing reading the internet right now?! One more view of the river before we head out for today! That's it for me and my theatreific, booktastic, Supergirl-swamped March! Please tweet or Facebook me about your own adventures!